Next generation sequencing (NG-seq) is a high throughput method that can be used downstream of chromatin immunoprecipitation (ChIP) assays to identify and quantify target DNA enrichment across the entire genome. SimpleChIP® ChIP-seq Multiplex Oligos for Illumina® (Single Index Primers) contain adaptors and primers that are ideally suited for multiplex sample preparation for NG-seq on the Illumina® platform (Illumina, Inc.). This kit can be used to generate up to 12 distinct, barcoded ChIP-seq DNA libraries that can be combined into a single sequencing reaction. This product provides enough reagents to support up to 24 DNA sequencing libraries, and must be used in combination with the SimpleChIP® ChIP-seq DNA Library Prep Kit for Illumina® #56795. SimpleChIP® ChIP-seq Multiplex Oligos for Illumina® (Single Index Primers) can generate 12 different, barcoded samples if each Index primer is used only once with Universal PCR Primer for Illumina®. Each Index Primer is supplied in sufficient amounts to generate two libraries, but these two libraries cannot be pooled together in one sequencing lane. 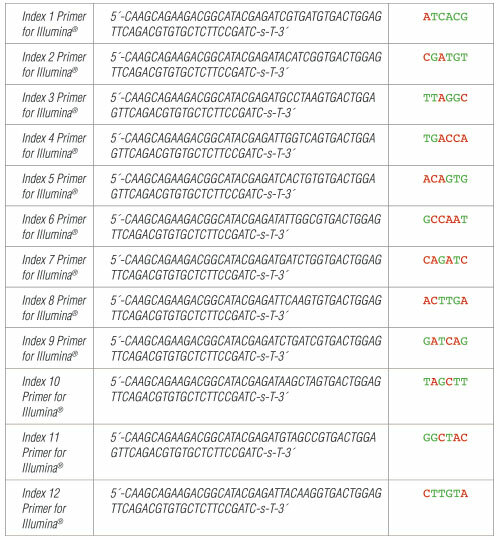 For 1-plex (no pooling), use any index primer with the universal PCR primer. Each Index Primer for Illumina® is provided in volume of 10 µl. Where -s- indicates phosphorothioate bond. Ensure that a valid combination of index primers is used. See Section I and II to verify that correct primer combinations have been selected. Add only one index primer (•) (5 µl) and 5 µl universal PCR primer (•) to each PCR tube. It is critical to change tips between tubes to avoid cross-contamination. Record the index primers added to each PCR tube. Add 25 µl Q5® PCR Master Mix (•) to each tube that contains primers. Add 15 µl of adaptor ligated ChIP DNA for a final volume of 50 µl to the corresponding tube. Gently pipette up and down 5–10 times to mix. It is critical to change tips between samples to avoid cross-contamination. Record the adaptor ligated DNA sample added to each PCR tube. Quickly centrifuge and perform PCR according to recommended cycling conditions (refer to the protocol for SimpleChIP® ChIP-seq DNA Library Prep Kit for Illumina® #56795). The components in the SimpleChIP® ChIP-seq Multiplex Oligos for Illumina® (Single Index Primers) #29580 are individually validated by the functional testing listed below and must pass rigorous quality control standards. Furthermore, each set of components is functionally validated together by construction and sequencing of indexed libraries on the Illumina® sequencing platform. 16-Hour Incubation: 50 μl reactions containing this adaptor and 1 μg of HindIII digested Lambda DNA incubated for 16 hours at 37°C results in no detectable non-specific nuclease degradation as determined by agarose gel electrophoresis. 50 μl reactions containing this reaction buffer at 1X concentration and 1 μg T3 DNA incubated for 16 hours at 37°C also results in no detectable non-specific nuclease degradation as determined by agarose gel electrophoresis. Endonuclease Activity: Incubation of a minimum of 5 μl of this adaptor with 1 μg of φX174 RF 1 DNA in assay buffer for 4 hours at 37°C in 50 μl reactions results in < 10% conversion to RF II as determined by agarose gel electrophoresis. Phosphatase Activity: Incubation of a minimum of 10 μl of this adaptor in protein phosphatase assay buffer (1 M diethanolamine @ pH 9.8 and 0.5 mM MgCl2) containing 2.5 mM p-nitrophenyl phosphate at 37°C for 4 hours yields no detectable p-nitrophenylene anion as determined by spectrophotometric analysis at 405 nm. RNase Activity: Incubation of this adaptor with 40 ng of a FAM-labeled RNA transcript for 16 hours at 37°C results in no detectable RNase activity as determined by polyacrylamide gel electrophoresis. Non-Specific DNase Activity (16 Hour): A 50 μl reaction in NEBuffer 1 containing 1 μg of Lambda DNA and a minimum of 50 units of Uracil DNA Glycosylase incubated for 16 hours at 37°C results in a DNA pattern free of detectable nuclease degradation as determined by agarose gel electrophoresis. A 50 μl reaction in Endonuclease VIII Reaction Buffer containing 1 μg of Lambda-HindIII DNA and a minimum of 25 units of Endonuclease VIII incubated for 16 hours at 37°C results in a DNA pattern free of detectable nuclease degradation as determined by agarose gel electrophoresis. Exonuclease Activity (Radioactivity Release): A 50 μl reaction in NEBuffer 1 containing 1 μg of a mixture of single and double-stranded [3H] E. coli DNA and a minimum of 50 units of Uracil DNA Glycosylase incubated for 4 hours at 37°C releases < 0.1% of the total radioactivity. A 50 μl reaction in Endonuclease VIII Reaction Buffer containing 1 μg of a mixture of single and double-stranded [3H] E. coli DNA and a minimum of 10 units of Endonuclease VIII incubated for 4 hours at 37°C releases < 0.5% of the total radioactivity. Endonuclease Activity (Nicking): A 50 μl reaction in UDG Reaction Buffer containing 1 μg of supercoiled φX174 DNA and a minimum of 50 units of Uracil DNA Glycosylase incubated for 4 hours at 37°C results in < 10% conversion to the nicked form as determined by agarose gel electrophoresis. Phosphatase Activity: Incubation of a minimum of 10 μl of USER® Enzyme at a 1X concentration in protein phosphatase assay buffer (1 M diethanolamine @ pH 9.8 and 0.5 mM MgCl2) containing 2.5 mM p-nitrophenyl phosphate at 37°C for 4 hours yields no detectable p-nitrophenylene anion as determined by spectrophotometric analysis at 405 nm. 16-Hour Incubation: 50 μl reactions containing this primer and 1 μg of HindIII digested Lambda DNA incubated for 16 hours at 37°C results in no detectable non-specific nuclease degradation as determined by agarose gel electrophoresis. 50 μl reactions containing 1 μl primer and 1 μg T3 DNA incubated for 16 hours at 37°C also results in no detectable nonspecific nuclease degradation as determined by agarose gel electrophoresis. Endonuclease Activity: Incubation of a minimum of 5 μl of primer with 1 μg of φX174 RF I DNA in assay buffer for 4 hours at 37°C in 50 μl reactions results in < 10% conversion to RF II as determined by agarose gel electrophoresis. RNase Activity: Incubation of 1 μl of primer with 40 ng of a FAM-labeled RNA transcript for 16 hours at 37°C results in no detectable RNase Activity as determined by polyacrylamide gel electrophoresis. Phosphatase Activity: Incubation of a minimum of 10 μl of this primer in protein phosphatase assay buffer (1 M diethanolamine @ pH 9.8 and 0.5 mM MgCl2) containing 2.5 mM p-nitrophenyl phosphate at 37°C for 4 hours yields no detectable p-nitrophenylene anion as determined by spectrophotometric analysis at 405 nm. 16-Hour Incubation: 50 μl reactions containing 1 μl Index [X] Primer for Illumina® and 1 μg of HindIII digested Lambda DNA incubated for 16 hours at 37°C results in no detectable non-specific nuclease degradation as determined by agarose gel electrophoresis. 50 μl reactions containing Index [X] Primer for Illumina® and 1 μg of T3 DNA incubated for 16 hours at 37°C results in no detectable non-specific nuclease degradation as determined by agarose gel electrophoresis. Endonuclease Activity: Incubation of a 50 μl reaction containing 1 μl Index [X] Primer for Illumina® with 1 μg of φX174 RF I supercoiled DNA for 4 hours at 37°C results in less than 10% conversion to RF II (nicked molecules) as determined by agarose gel electrophoresis. RNase Activity: Incubation of a 10 μl reaction containing 1 μl Index [X] Primer for Illumina® with 40 ng of RNA transcript for 16 hours at 37°C resulted in no detectable degradation of RNA as determined by gel electrophoresis. Phosphatase Activity: Incubation of Index [X] Primer for Illumina® in protein phosphatase assay buffer (1 M diethanolamine @ pH 9.8 and 0.5 mM MgCl2) containing 2.5 mM pnitrophenyl phosphate at 37°C for 4 hours yields no detectable p-nitrophenylene anion as determined by spectrophotometric analysis at 405 nm. Next generation sequencing (NG-seq) is a high throughput method that can be used downstream of chromatin immunoprecipitation (ChIP) assays to identify and quantify target DNA enrichment across the entire genome. SimpleChIP® ChIP-seq Multiplex Oligos for Illumina® (Single Index Primers) contains adaptors and primers that are ideally suited for multiplex sample preparation for NG-seq on the Illumina® platform. This kit can be used to generate up to 12 distinct, barcoded ChIP-seq DNA libraries that can be combined into a single sequencing reaction. This product is compatible with SimpleChIP® Enzymatic ChIP Kit (Magnetic Beads) #9003, SimpleChIP® Plus Enzymatic ChIP Kit (Magnetic Beads) #9005, and SimpleChIP® Plus Sonication ChIP kit #56383. This product is not compatible with SimpleChIP® Enzymatic Chromatin IP Kit (Agarose Beads) #9002 and SimpleChIP® Plus Enzymatic Chromatin IP Kit (Agarose Beads) #9004 because agarose beads are blocked with sonicated salmon sperm DNA, which will contaminate DNA library preps and NG-seq. This kit has been validated in combination with SimpleChIP® ChIP-seq DNA Library Prep Kit for Illumina® #56795 to generate qualified DNA libraries using 50 ng, 5 ng, or 0.5 ng ChIP DNA as starting materials. Libraries prepared from different starting amounts of ChIP DNA exhibit similiar Bioanalyzer® profiles, genome mapping rates, numbers of identified binding peaks, and signal-to-noise ratios across the whole genome.